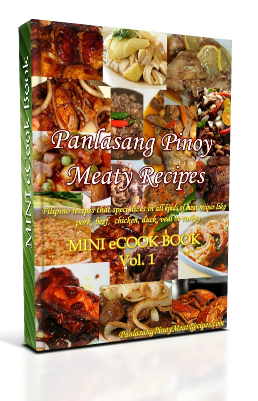 Panlasang Pinoy Meaty Recipes eCook Book. It contains recipes of popular Filipino pork, beef, chicken, fish and seafood recipes. The book was compiled in a beautiful mini ebook in PDF format. You can download it instantly after you input your email address on the small box below and hit the submit button. So hurry! just click the submit button below and get instant access to download your very own Panlasang Pinoy Meaty Recipes eCook Book. Just hit the “like” or “tweet” button and get the eBook. Im happy that i will learned to cook all ur recipe. Hi! I have already subscribed on your website. But I was wondering how can I download the ebook? I was just being redirected to activate the said subsription but no link to the ebook given. I hope to hear from you. Thank you. After you activate your subscription by clicking the link, another email will be sent you containing the link where you can download the ebook. Check your mailbox again. I really appreciate your effort in coming up with this one – so self-giving and generous of you. I’ve been a ‘silent follower,’ meaning,yours is my ‘run to’ whenever i needed an easy, yummy recipe coz the ingredients are all-too familiar and almost always readily available. Thank you, a lot! Thanks and Keep uploading recipes. 🙂 they are very helpful. Hi. I like cooking your dishes by watching them on line. I wanted to share your recipes to my nephew but they live in the province and doesnt got a chance to be on line all the time. Do you have a cookbook? I wanted to send one to him. Hi Gina, I only have a downloadable ebook in pdf format.